Kick off your visit on the 13th (Sat): look for all kinds of wild species at Butterfly Park of Benalmadena, take a stroll through Benalmadena Pueblo (The Old Village), then wander the streets of La Carihuela, and finally examine the collection at Museo Automovilistico. Here are some ideas for day two: explore the world behind art at Museo Carmen Thyssen Málaga, then delve into the distant past at Roman Theatre, then steep yourself in history at Castillo de Gibralfaro, and finally examine the collection at Museo del Vidrio y Cristal de Malaga. For where to stay, maps, and other tourist information, use the Malaga sightseeing planner. Kuala Lumpur, Malaysia to Malaga is an approximately 28-hour flight. The time zone difference when traveling from Kuala Lumpur to Malaga is minus 7 hours. Plan for much colder temperatures traveling from Kuala Lumpur in January, with highs in Malaga at 19°C and lows at 8°C. Finish your sightseeing early on the 15th (Mon) to allow enough time to take a train to Cordoba. Appreciate the collections at Archaeological Ensemble of Madinat Al-Zahra and Sala el Potro. 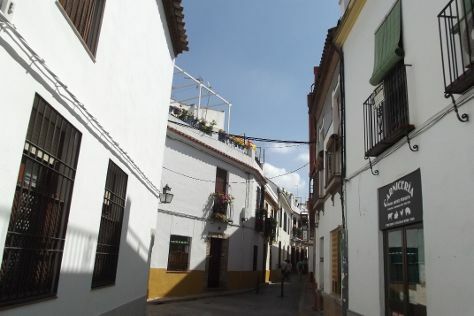 Eschew the tourist crowds and head to Roman Bridge and Calleja de las Flores. And it doesn't end there: make a trip to Historic Centre of Cordoba, take in the architecture and atmosphere at Capilla Mudejar de San Bartolome, wander the streets of Jewish Quarter (Juderia), and take an in-depth tour of Palacio de Viana. For reviews, more things to do, other places to visit, and tourist information, read Cordoba vacation trip planner. Getting from Malaga to Cordoba by train takes about 1.5 hours. Other options: drive; or take a bus. Traveling from Malaga in January, Cordoba is little chillier at night with lows of 5°C. Finish your sightseeing early on the 18th (Thu) to allow enough time to take a train to Seville. Start off your visit on the 18th (Thu): steep yourself in history at Plaza de Toros de la Maestranza, take a stroll through Triana, and then contemplate in the serene atmosphere at Basílica de la Macarena. Get ready for a full day of sightseeing on the next day: tour the pleasant surroundings at Casa de Pilatos and then get to know the fascinating history of Barrio Santa Cruz. To see photos, other places to visit, maps, and tourist information, you can read our Seville travel planner. Traveling by train from Cordoba to Seville takes an hour. Alternatively, you can drive; or take a bus. In January, plan for daily highs up to 17°C, and evening lows to 7°C. Finish your sightseeing early on the 19th (Fri) to allow enough time to travel back home.